My first girls night outing since the baby was to one of my favorite places in town, the Phoenix Art Museum. The curator of the Fashion Gallery was giving a talk on the current collection The Sea. I have always loved the water and to combined the two in a collection sounded divine. We were taken through the centuries by the sea and how history and acceptability have transformed the fashions. I loved seeing the designers inspirations. The collection ranged from the mid 1800’s to current day. I stole a few clicks of my favorites. 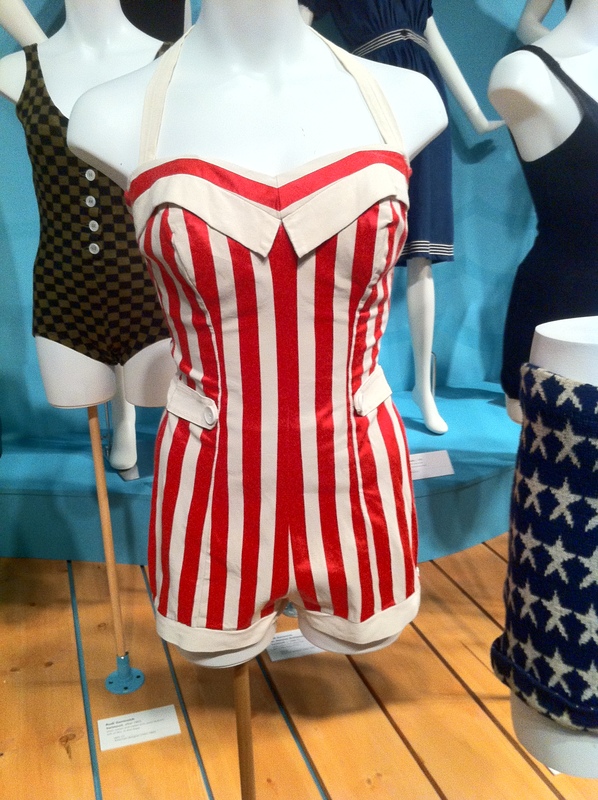 The red and white vintage swim suite in contrast with Chanel’s latest collection including the terry cloth jacket. 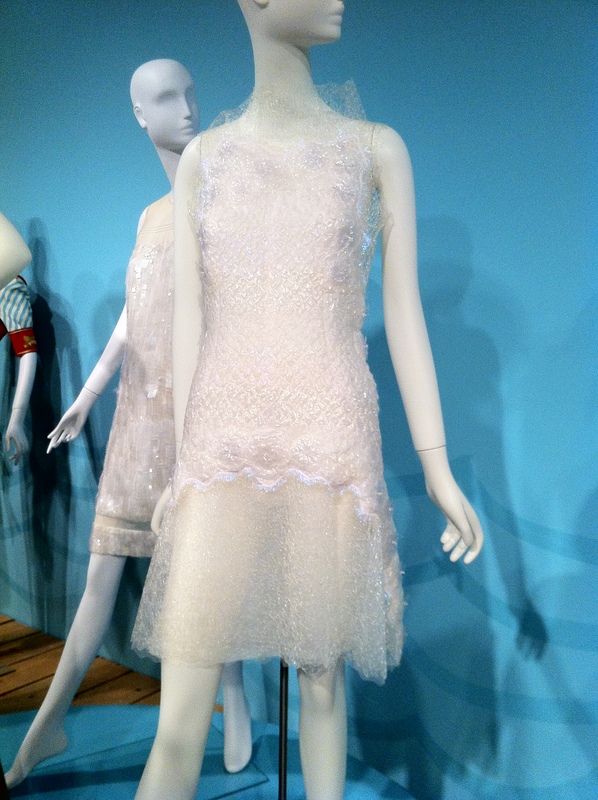 It was also a treat to view one of Chanel’s dresses in which I just saw in the pages of the latest Vogue. Pardon the poor picture quality. I was using my phone in an attempt to be discrete. The collection as a whole was both beautiful and educational. Next up on the exhibition list for the fall is the 1920’s. You better believe I won’t miss that one either! I am currently 8 months prego and have been on bed rest for almost 3 months now. Not only has it been a bit maddening, but I haven’t had an occasion to get nice and dressed up! It is truly sad when your doctor’s appointments are your only outings and you get excited because it’s an excuse to put on some jeans and a cute top. In an effort to bring some glam into my sweatpants days, I have found some great looks from a pea in the pod for those date nights, celebrations, what have you. I may not have a chance to wear them, but they sure are fun to look at and imagine the possibilities! A few years back I started understanding the importance of eating organic. Although there are many that scoff at the organic diet, including myself at one point, it is a choice I came to after doing some research on the food industry and illness. But don’t worry, this post is not about organic food OR the food industry. Organic clothing seemed a natural extension from the dietary lifestyle. But where to start? I have found a couple of websites with some great selections and posted a few of my favorites. Many of the looks get simplified and replicated by less expensive designers and show up in the department and discount chain stores. Some designers can get annoyed with this downstream marketing, however, others feel imitation is the best form of flattery. Often times it can be difficult to know what will stick and what will be forgotten. Movies and celebrities help in this sense as well. If the designer is lucky enough to have a celebrity love their clothes, wear them and promote them, it instant success. Many looks have been seen for the first time in a movie and have taken off. Political wives also play a big part in setting trends from Jackie O to Michelle Obama. When looking for possible trends, I try to see look out for repetition and practicality. For example, if there is an idea or color theme that is present throughout many different collections and it is an idea the average shopper could pull off for the office or a night out, that is a good place to start. 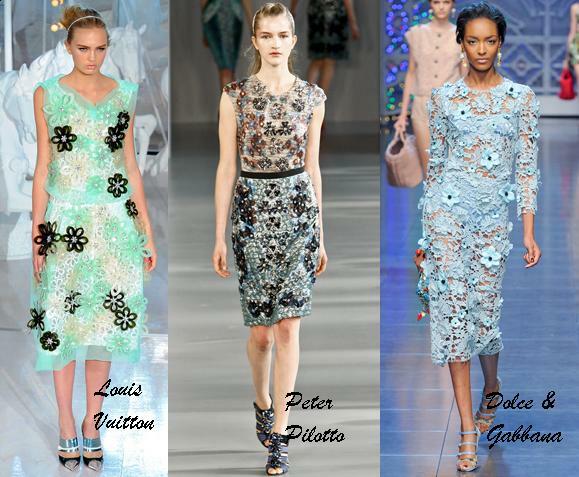 I have begun to look through the latest 2012 Spring RTW collections and picked out a couple consistencies which I have put together below. Only the future will show whether or not these trends will play out, but it’s always fun to predict. In fact, it’s one of my favorite past times. 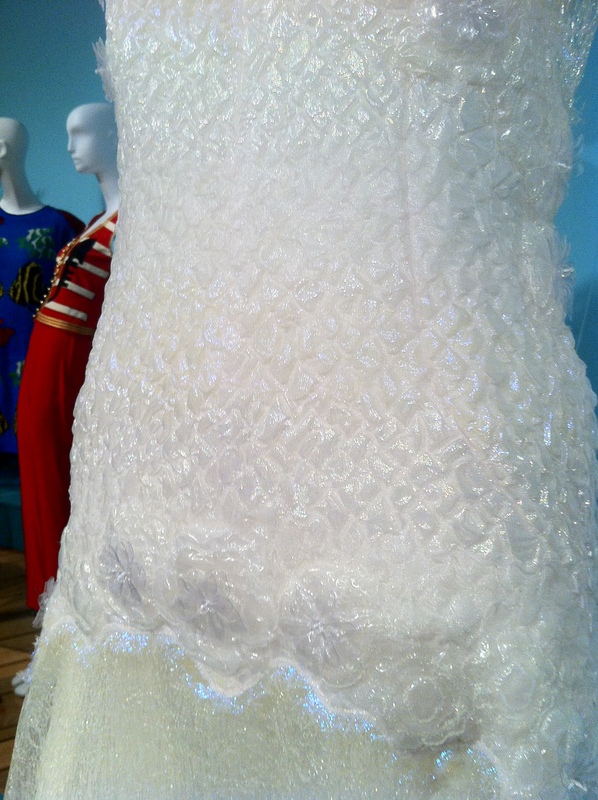 …and to go along with the lace were 3D flowers in all shapes and sizes. What’s out that I haven’t heard of…. With it being fashion week frenzy all over the world, I love to visit style.com and check out the names I’ve never heard of. This time around, I stumbled upon Vena Cava’s Spring 2012 collection. The team consists of Sophie Buhai and Lisa Mayock who are New York designers producing 15 collections over the past eight years. It’s a shame I haven’t found them until today. Thier clothes are both fun and practical. Two traits I always admire in a designer. I have included some of my top picks below. I highly recommend checking them out.